We have received some questions about how the ‘bargaining gap’ model of inflation that we use in The Economy works. For example, Nick Rowe, a Professor of Economics at Carleton University in Ottawa, Canada, has asked why inflation would be lower in our model if a central bank targeted 2%, rather than 4% (our colleague Rajiv Sethi has preserved the Twitter conversation on Storify). To answer Nick’s question and others raised in the thread, we thought it would be useful to explain in more detail why we think the ‘bargaining gap’ model reflects empirical observations, how it relates to ‘money’, and why we think it is an improvement on the models of inflation that most introductory students are learning. The usual introductory treatment of inflation centres on money – ‘too much money chasing too few goods’. In CORE’s The Economy, money plays a role but we see it as unhelpful as the organizing concept because it is linked only weakly to the broader model of fluctuations in the aggregate economy. The central bank has an inflation target. If inflation is forecast to be higher or lower than the target, the central bank’s job is to use its policy tool, the policy interest rate, to guide the economy back to inflation at target. To decide what interest rate to set, the central bank has to figure out the level of aggregate demand that will generate inflation closer to the target. If, for example, inflation higher than the target is forecast, it will want to dampen aggregate demand by raising the interest rate. Lower aggregate demand will raise unemployment and reduce the ability of workers to get higher wages – inflation will fall. Inflation will fall because of a lower bargaining gap. So, given its inflation target and its inflation forecast, the central bank chooses the appropriate real interest rate to deliver the intended level of aggregate demand that delivers, in turn, the required output gap (and hence, bargaining gap) to put the economy on the path back to meet its inflation target. The central bank figures out the (nominal) lending rate that banks will have to set to produce the spending by households and firms in line with the intended level of aggregate demand. It then sets the policy rate that will deliver that lending rate. As in any model of inflation targeting, the money supply responds endogenously to money demand (which, using the chain of reasoning above, is ultimately related to the central bank’s inflation target). So the rate of inflation in such a regime is pinned down by the central bank’s inflation target. If the central bank targets a rate of 4% rather than 2%, then given the evidence that wage inflation does not respond directly to announcements of a new inflation target, it will have to generate sufficient aggregate demand to create a positive bargaining gap. If it successful, then inflation will settle at a rate of 4%. It is the central bank’s inflation target rather than the ‘growth rate of the money supply’ that pins down the rate of inflation. This approach is consistent with an endogenous supply of money – we do not want to put arbitrary restrictions on the velocity of circulation or the stability of the demand for money. Under inflation targeting, this could be called ‘an inflation target model of inflation’, in which deviations from the target are explained by the bargaining gap. This is consistent with what has happened at the zero lower bound, at which the money supply has been dramatically increased with no effect on inflation. If there is a negative bargaining gap at the zero lower bound, this model would predict continuous deflation, which we haven’t seen. QE has helped stabilize aggregate demand and inflation expectations. For the reasons explained in explained in section 9.7, it is plausible that there is a zero floor on money wage inflation (and hence on price inflation), which flattens the wage-setting curve and eliminates the negative bargaining gap. Outside an inflation-targeting regime, as we discuss in Unit 15, inflation can increase depending on the combination of the expectations process and the bargaining gap. In this unit, we work through both the ‘static’ Phillips curve and the ‘expectations augmented’ Phillips curve. We use the 45-degree diagram to help students understand that aggregate demand must be sustained in order to fuel inflation. 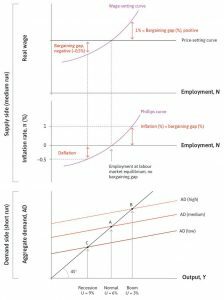 For example, Figure 15.4d, showing bargaining gaps, inflation and the Phillips curve. We have reproduced the static version on the right, but we strongly recommend that you look at the interactive version, which makes the process much clearer. For inflation to rise continuously, there would have to be monetary accommodation (rather than inflation-targeting), otherwise the real interest rate would rise, choking off aggregate demand – as shown in the 45-degree diagram – reducing the bargaining gap, and dampening inflation. In all these cases, the bargaining gap is key to understanding the dynamics of inflation.